Enter to Win Vital Whey Protein Powder! Looking for a delicious and nutritious way to boost protein in your diet? Look no further than Vital Whey – the finest grass fed whey protein powder from Well Wisdom. It’s whey protein derived from cows which are bovine growth hormone free, GMO free and graze year-round on grass pastures. Whey Protein Concentrates are the most efficient type of protein for your body to utilize as measured by the Biological Value (BV). They have the highest BV of any protein – 104 compared to 100 for Whey Protein Isolates and eggs, 83 for Rice Protein, 80 for beef, 77 for Casein Protein, and 65 for Pea Protein. Vital Whey protein has the highest overall level of critical amino acids that help you to build muscle, recover faster from workouts, and to boost your immune system. The company sent me a sample to try and wow – I was impressed! Not only can you add Vital Whey to your shakes and smoothies, you can also use no bake recipes packed with this delicious protein. Below is a smoothie recipe we tried at home – and loved! And we’ve got great news! We are offering Vital Whey prizes to 5 lucky AppforHealth.com readers. Entries will be accepted through February 21, 2017. Rinse kale. 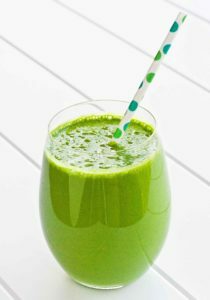 Place the chopped kale into the blender first, followed by the Vital Whey, avocado, kiwi and milk or coconut water. Blend it all up on high for 10 to 15 seconds and enjoy straight away for the best flavor and health benefits. Disclaimer: We are delighted to have partnered with Well Wisdom Vital Whey for this promotion. All opinions are our own. I have “Liked” AFH on Facebook. I have “Liked” WellWisdomWhey on Facebook. I would like to try this because I have never had Vital Whey protein. I would like to use it in smoothies. I like both Facebook pages. I would enjoy adding this to my workout shakes as well. I would love to win Vital Whey Protein Powder because my New Year’s Resolution is to go Greener! I’ve improved my veggie intake but I have room for improvement! I’d like to win Vital Whey protein to add to my smoothies and shakes to enjoy after workouts. I’m impressed that it contains the highest overall level of critical amino acids that help you to build muscle, recover faster from workouts, and to boost your immune system. I need to add more nutritious protein to my diet and this would make a delicious shake with almond milk. I’m a FB fan of both. This healthy protein is vital to my immune system and would be helpful and provide me with many nutrients. I liked AFH and Well Wisdom Whey. I use whey protein quite often, and this looks like a high-quality one, so I would love to win! Thank you!! I calculate my macros daily and need to add protein supplements so I have been looking for a whey protein option that is grass fed. Oh yum! I am a smoothie gal and I’m looking for a great protein shake. I’ve gone with other brands and I still haven’t found my “right fit.” This would be super easy in my Vitamix blender too! I’ve been reading that Whey protein is a better protein to consume. I have not tried it yet, but am quite interested so I would love to win this to satisfy my curiosity. 🙂 Thank you for the chance! Have liked both pages and I would love to win because I have 2 teenage sports enthusiasts and I am looking for a protein powder to supplement our smoothies I make for them with a taste they will actually enjoy. So much money spent on other brands and haven’t found one yet they like. Thanks from an all around sports mom!! It would be a delight and I would simply love to win Vital Whey Protein Powder as I’m super excited to try something new. I’ve changed my diet for 2018 and have incorporated healthier foods into my diet such as protein, veggies, bean, nuts and fruit so I can lose weight and improve my overall health so I can live longer to help my husband and mom. Loving life and everything that comes my way! Yahoo! I have been consistent with working out so this would help me too lose and few extra pounds and get in shape. Id love to try a recommendation of Whey Protein from you girls! There are so many out there and Ive tried so many! Drinking the Crossfit Juice now.. Your “liked” on every app there is! I’m excited to try Vital Whey Protein Powder because it’s GMO free and bovine growth hormone free! It has the highest BV of any protein and sounds like it would taste great in a smoothie! Thanks for the opportunity to win this! I’d like to win because trying new high quality protein powders sounds like fun!! We bake and do smoothies with protein and I’m always looking for better options! I would love to win and try this protein powder. My husband and I use protein powder each day and Vital Whey has a good amount of protein and seems terrific. I am a fan of both Facebook pages. I would add this to my blended veggie/fruit smoothies to add more nutrition and satisfying protein for my muscles. I follow on Instagram via @serene_streams! I would really LOVE to win some of your whey protein powder as I JUST had Bariatric surgery which is definitely going to change my life forever in a MOST POSITIVE way, and I now NEED TO EAT 60 to 90 grams of protein every day for the next year or more. I started my journey after watching fat, sick, and nearly dead 2 years ago, which prompted me to join a gym and work out 3 times a week for the last 1 1/2 years, losing 38 pounds over that period of time, but I needed to do more, and faster, as my health was getting worse faster than my weight loss was helping, thus the surgery 2 weeks ago. I have liked WellWisdomWhey on Facebook. I would like to try this because it helps you to build muscle, recover faster from workouts, and to boost your immune system. It would be nice to win this item so I can introduce some new items with health benefits. I would give this to a good friend of mine who is on a low carb keto diet. This would be a great way to insure she is getting the protein she needs. I think she would live this! would love to find a protein that i like!